Oh, the terrible twos… and threes… and sometimes fours in many cases, but we will discuss how long the terrible years last later. Between the tantrums and protests, you might be looking for some toys that will entertain your little guy and distract him from getting into any more trouble. Maybe you are just looking to give a gift, but either way we wanted to pull a list together of some of the best toys for 2 year old boys. Two is kind of a funny age when it comes to toys because they are not quite babies, but they are not ready for the big kid toys yet either. You are going to want to find something that helps them in their development yet is still super fun. Our Rookie Mom Squad found 20 great toys that a 2 year old boy will love. I once had this delusion that my little boys would be willing to play with any toys, not just trucks and dart guns, but that quickly came to an end. This little bulldozer is all boy and one of the best toys for 2 year old boys. It will be great for his motor skills because he actually gets to put the bulldozer together and then play with it too. Check current prices here! Magnetic Blocks are one of my absolute favorite toys for my 2 year old. I love it because not only does it entertain the little guy for quite a while, all my kids enjoy playing with them. Even I find myself sitting down with my little one for a long time playing these magnetic blocks. Ther are a ton of fun. In addition, it is a great way to teach your little one about shapes and colors. Check Current Prices Here! This is definitely a classic as in Grandpa probably even had a set when he was little, but that doesn’t mean your little one won’t absolutely love it. Nothing is wrong with tried and true. 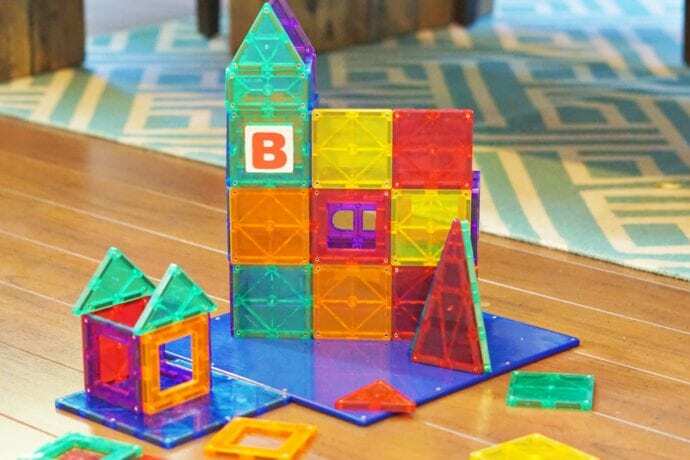 Your little architect can build castles, towers, and anything else they can imagine. Check current prices here! What little boy doesn’t want to be just like dad? This little play grill will let them whip up some yummy (plastic) hamburgers and hot dogs! It even has these adorable little grill utensils. Check current prices here! My oldest son’s absolute favorite toy as a toddler was this little vacuum he could push around. I’d say it’s because he wanted to be just like his mama, but let’s get real when he was two and a had a newborn I couldn’t even tell you where our real vacuum was. Anyways, your little dude might want an ironing board. Who knows? It’s undeniably an adorable set. Check current prices here! This indoor playground is tons of fun and will entertain your little ones for years to come. We love the idea of this because our little two year old loved to climb on everything. This way, when he wanted to climb we would just tell him to go play on his gym where it was safe to climb. There are a ton of different options, we just preferred this style as it does not take too much space in a room. We live in this world driven by technology, so any head start in that department is great for your child. This toy is supposed to help teach the fundamentals of coding and with its bright lights and fun colors, your two year old will think it’s just all fun and games. Check current prices here! Amazon has recently come out with a great gift for parents, grandparents, aunts and uncles to give to the little one in their life. Amazon Prime Book Box for Kids is a subscription service which chooses up to 3 books for you to read your little one. They are all organized based off your child’s age and you can choose how often you want the box distributed, once a month or 2 months or even 3 months. If there is a book you don’t like or already have, you can choose to have another book shipped instead. Yes, this might not be a toy, but it is a great gift for kids. Do you have a kid who likes to put things together just to take them apart and put them back together again? This little rocket will make that a piece of cake. Plus it’s honestly the cutest little rocket that I’m sure they will love to play with even when it’s all put together. Check current prices here! I swear this is actually for your two year old. I am not just recommending it because of how ridiculously cute I think it is. With a detachable bottom floor mat, it can go inside or outside for whatever adventure is calling. I just love the idea of reading books inside this teepee or letting their imagination run wild. Check current prices here! Little boys love playing with cars, which is why this item is included in our best toys for 2 year old boys article. I am 99% sure it’s so they can constantly make a vroom vroom noise to the point that they are driving you crazy. These little wooden cars come with a wooden semi truck to be loaded onto via magnet, which I know my toddlers would have gotten a huge kick out of. Check current prices here! The classic rocker horse will always be one of my favorite baby items. However, this play and rock takes things to a whole new level making it perfect for toddlers. It even plays songs that will help them learn numbers, shapes, and the alphabet. Check current prices here! Get them started early on the whole bike riding thing with this adorable trike. It will keep them balanced and safe in the comfy seat with a back. Check current prices here! For those who want to get started on the whole bike thing but their two year old wants to be like the big kids, this is the perfect item for you. It looks like a normal bike minus the pedals because it’s made for your toddler to walk along with. Don’t forget a helmet though! You know your daring little one might just try to lift his feet up. Check current prices here! Got a toddler with way too much energy? I know what it feels like and this mini trampoline was a life saver sometimes. It’s especially nice for cold or rainy days when you don’t get the chance to go outside and your toddler has extra energy to burn. Check current prices here! A great way to introduce letters and their sounds to your toddler is with their own name. You can order one of these puzzles to do just that! Check current prices here! Let their creativity run wild without all the mess with one of the best toys for 2 year old boys. It comes with two pens, that only work on the mat so they won’t ruin anything. The size of this mat is awesome and will give your toddler plenty of room to make a masterpiece. Check current prices here! This is another toy that’s perfect for indoor or outdoor fun. It comes with a basketball made perfect for toddler hands, and the hoop can adjust as your kiddo grows. Check current prices here! I wish I would have had this for my kids! It’s a play stove, oven, and refrigerator with precious little accessories so you’re little guy can become a little chef. Check current prices here! This is a great toy for any sporty kiddo with basketball and soccer all in one. It even keeps score, which helps your little one learn numbers, and cheers for them when they are doing well. Check current prices here! Bring it back to the basics. Your toddler will be entertained with these blocks long enough for you to get at least one thing done. Just make sure they’re all picked up during clean up time so no one accidentally steps on one. Check current prices here! These are awesome because even though they are dinosaurs, they have little wheels on their feet! Two year olds love being able to push things around on wheels and it’s nice for it to be something other than a car every once in awhile. Check current prices here! Leapfrog is one of my favorite brands because they make teaching my kiddos the basics like letters and numbers. With all the buttons and different noises this little play laptop can make, your child will have so much fun. In fact, they won’t even realize they are actually learning something. Check current prices here! Thank you for your valuable resources keep share the information!